Should Senate Bill 143 [B1] pass this legislature it will be a historical landmark of considerable significance. It will mark the point where a rich Montana wildlife conservation ethic held since our territorial years was jammed into a shuddering reverse. When the first Territorial Legislature convened, brothers James and Granville Stuart were members and they came with a fish and wildlife conservation ethic. James won passage of legislation protecting fish by restricting harvest to hook and line fishing. It’s noteworthy that this legislation became Montana law 12 years before Custer bit the dust at the Little Big Horn. A Montana wildlife conservation ethic was held by the people and they, through their legislators, asserted that ethic through the years. In fact this 2013 session marks the 100th anniversary of State Senator T.O. Larsen (R) from Choteau introducing and passing a bill to create the Sun River Game Preserve to promote wildlife recovery. The bill passed the Senate on a vote of 26 to 0 – with 6 absent or not voting. Governor Sam V. Stewart (D) signed the Bill. There obviously was a legislative conservation ethic in 1913 and it was clearly beyond political party ideology. Now, a century later, that vision and foresight has provided Montana with the moniker, “The Last, Best Place.” That identity fits because of the fish and wildlife that has been restored and nurtured since James and Granville Stuart pointed us toward the higher ground. Today, we stand poised and capable of topping off this conservation legacy by adding the one species that paid the highest price in this epic struggle of wildlife restoration; Buffalo. The Montana people clearly support a modest level of wild buffalo restoration. Nobody with any credibility is talking about herds thousands strong running through the breaks. What we are talking about is small, isolated herds that fit with the available landscapes, while minimizing the conflict between Montanans. However, Senate Bill 143 of the 2013 Montana Legislature, simply says kill them all – anyone, on any day – kill them all. In 1872 our Territorial Legislature found the liquidation of buffalo shameful. Today, that conservation ethic and the dedication to our Tribal neighbors apparently has vanished. Exactly a century ago the 1913 Montana State Legislature gave overwhelming approval to the quest for a better way, a more profound relationship with Montana wildlife. It would be shameful indeed to observe the centennial of the 1913 commitment to conservation with legislation of liquidation – Senate Bill 143. We need to listen to and heed the counsel of our forefathers. We need to demand a resounding no vote on Senate Bill 143. 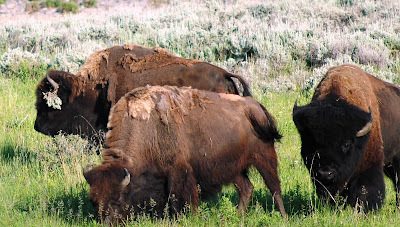 If passed, this bill would eliminate the Yellowstone Bison hunt, eliminate game animal status for bison, keep tribes from growing their own bison herds and continue to wasteful and tragic slaughter of America’s grandest land mammal. Brownell, Joan Louise. The Genesis of Wildlife Conservation in Montana. Master of Science Thesis, Montana State University. May 1987. A Bill for an Act entitled: “An Act to establish a game preserve in the Rocky Mountains, for the Protection of Game Animals and Birds, and Providing a Penalty for Killing, Hunting or Pursuing any such Animals in such Preserve Senate Journal 13th Session, 1913, Montana..